Would you like to arrange your special moment on board? Bring your closed ones to celebrate your birthday on board, propose to your girlfriend, arrange your wedding on board, invite your friends - whole day of fun that will remain in your memory forever! 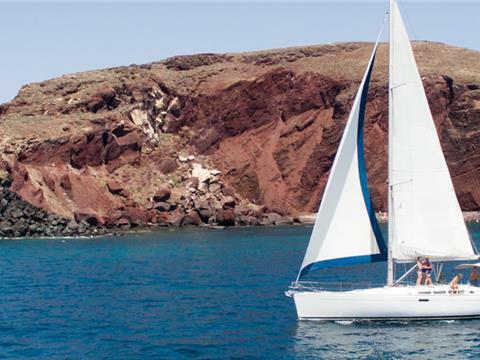 A private cruise constitutes a great opportunity to sail and explore Santorini without hassle and responsibility, but with all the fun. You will be sailing the islands aboard a 49 foot sailing yacht, accommodating up to 12 guests in a spacious sitting area under a large tent or on the deck with cushions for sunbathing. Toilets and cabins are available inside the yacht. Whether relaxing or sunbathing on deck after a peaceful swim in a remote bay, your comfort and enjoyment are assured. Beginner and novice sailors will also benefit from the opportunity to learn about sailing first-hand through instruction from the skipper and the on board sailing crew. The skipper, in addition to being responsible for the safe and enjoyable sailing of the yacht, is also acting as a personal guide and caretaker for the guests. You can follow our usual program or create your own exploration route according to the wind direction, after discussion with the captain. Leave some room for a sumptuous lunch or dinner! This is a casual sit-down affair; it’s never formal and there is never assigned seating. Meal is served on an open air table on the aft deck. Complimentary locally brewed beer, wine and soft drinks are available all day. You’re free to bring your own spirits on board to mix up your own favorite tropical drink. 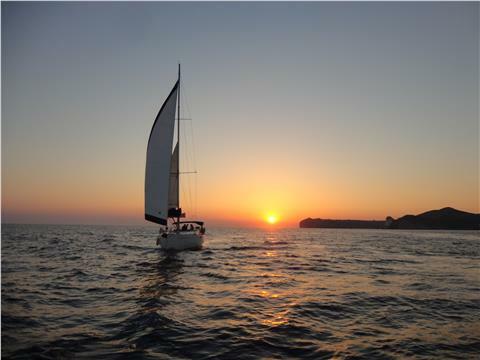 Sailing is invigorating and exhilarating - whether you’re helping the crew hoist the sails or just shouting encouragement between sips of a cool drink. Take the helm – for a photo op or the real deal! Our crew is eager to teach you all about the ship, the islands and their people. What to bring: a carry-on bag with a bathing suit and everything that you will need in the early afternoon (sunscreen, hat, medicines and cameras) along with something warm to wear after sunset, as it might be a little bit chilly. If you think you might be affected by motion sickness, bring a wrist band or an ear patch to ease the symptoms.